Turn to Challenges in Inflammatory Bowel Disease (IBD) when you need an expert opinion on the new, unusual or controversial areas of IBD and not just the tried and tested information. Current and concise reviews of the latest scientific discoveries are translated into cutting–edge clinical guidance to address those challenging cases faced by every medical team caring for patients with IBD. Refer to this book to answer burning questions, to read an in depth review of the controversial topics and to provide a clear explanation of issues. List of Contributors and Editors. I Clues to aetiology and pathogenesis. 1 Richard F. A. Logan and Emma L. Armitage. 2 John B. Beckly, Tariq Ahmad and Derek P. Jewell. 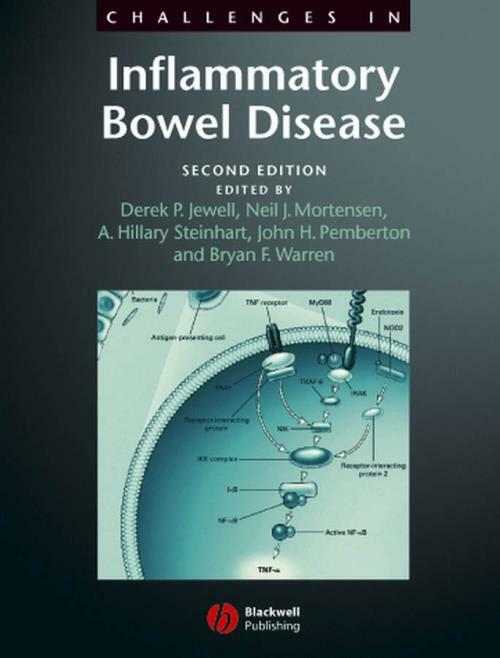 The role of genetics in inflammatory bowel disease. 3 Robin G. Lorenz and Charles O. Elson. Microbial sensing in the intestine by pattern recognition receptors. 4 Robert Penner and Karen Madsen. The appendix how might it influence susceptibility to ulcerative. colitis: the legend of Qebehsenuef. 6 Bryan F. Warren and Neil A. Shepherd. What are the controversies in histopathological diagnosis?. 7 Gary C. Chen and Simon K. Lo. The challenges of using capsule endoscopy in the diagnosis and management of inflammatory bowel disease. 8 Stuart Taylor and Steve Halligan. Cross–sectional imaging of inflammatory bowel disease. III Management of ulcerative colitis. 9 Miles P. Sparrow, Wee–Chian Lim and Stephen B. Hanauer. Mesalazine for maintenance therapy in ulcerative colitis how much, how long?. 11 Fergus Shanahan, Jude Ryan and Shomik Sibartie. Pharmabiotics and inflammatory bowel disease on the verge of evidence–based medicine. 12 R. John Nicholls and Mark J. Cheetham. Current controversies in the surgical management of ulcerative colitis. 13 Alan F. Horgan, William J. Sandborn and John H. Pemberton. What are the causes and treatment of ileoanal pouch dysfunction?. IV Management of Crohn s disease. Is mesalazine useful in Crohn s disease?. 16 Severine Vermeire and Paul Rutgeerts. Do antibiotics have a role in Crohn s disease?. The optimal use of infliximab in Crohn s disease. 18 Stephan R. Targan and Loren C. Karp. Designer drugs: from bench to bedside. 19 W.M. Chambers, I. Lindsey and N.J. Mortensen. Current controversies in the surgical management of Crohn s disease. 20 Carl J. Brown and Robin S. Mcleod. 22 Urban Sjoqvist and Robert Lofberg. Colonoscopic surveillance if and when?. 23 Ralf Kiesslich and Markus F. Neurath. 24 Jacintha N. O Sullivan and Teresa A. Brentnall. Molecular markers a realistic hope?. 25 Maha Guindi and Robert H. Riddell. Adenomas versus dysplasia associated lesion or mass recognition and management?. 26 Thomas D. Walters and Anne M. Griffiths. 29 Robert Hilsden and Lloyd Sutherland. Can prognosis of ulcerative colitis be predicted?.